You can set up your Stray Star GPS Tracker to send text alerts when certain things happen - allowing you to respond asap. 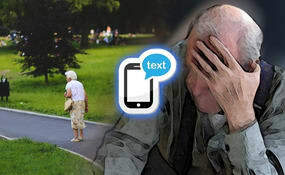 You can also have one carer receive SOS alerts, and a different carer receive other alerts (e.g. wandering, fall, low battery). Alerts can be enabled or disabled via a simple text message. One of the key benefits of GPS Trackers for dementia and Alzheimer's is knowing when the person wanders. Also called geofencing, you can set a radius (upwards of 50 meters) from where the tracker is - if the person then wanders beyond this distance, you (and two other carers if necessary) can receive a text alert. You can create up to three different zones (of varying sizes and places) that send an alert if person walks out of them (e.g. away from home), or into them (e.g. a particular destination). If you use online tracking, you can be emailed a notification instead, and can create all kinds of geofence-shapes on a map. Our Stray Star GPS Trackers work great as fall detectors. They have built in motion sensors - so if the wearer (who may be a vulnerable adult or with risk of stroke) should fall, the device will sense an impact and trigger a Fall Alert. To prevent false alarms, it will beep ten times first, during which time the wearer can cancel the alert by pressing the main button on the front. As well as a text alert to up to three people, it can also call each person in turn until someone answers, to allow a two-way conversation. This allows a carer to offer some reassurance that someone is on their way. The SOS button on the front can be assigned to up to three relatives/carers numbers. 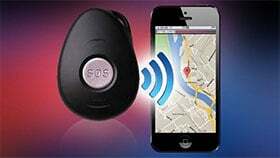 When pressed for any reason (being lost, confused, in need of help) the device will send a text alert saying "HELP ME!" with the the location link. It will then also call the numbers in turn until someone answers, so a reassuring two-way conversation can take place. If the wearer has dementia or Alzheimer's and won't remember to use the buttons, they can be disabled while still receiving other alerts (e.g. wandering, falls or low battery). When battery level is down to 15% – receive a text alert to know that it needs a charge (usually every few days). If the wearer drives or the device is in a vehicle, be notified if they go above a certain speed.